You are here: Home / Frequently Asked Questions / Pain and Suffering Recovery? Can I Sue my Employer Directly for Pain and Suffering Since Workers’ Compensation Does will not Compensate Me? No, you may not sue your employer for pain and suffering. Georgia law designates workers’ compensation as your exclusive remedy when you are hurt on the job. You can, however, sue negligent third parties for pain and suffering damages. Workers’ compensation laws arose many years ago in response to complaints from injured workers. Prior to the creation of workers’ compensation laws, injured workers had to sue their employers for damages. The problem: lawsuits can take months or years and disabled workers often did not have the money or staying power to engage in expensive litigation. 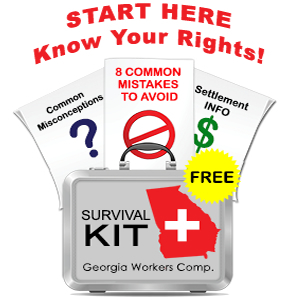 Georgia’s workers’ compensation laws are similar to laws enacted in other states. While you give up the right to sue your employer for pain and suffering, you also do not have to prove negligence. You need only show that you were injured while “on the clock” and performing a work related task. This means that you are eligible for workers’ compensation benefits even if your injury arose from your own negligence. Workers’ compensation is therefore considered a “strict liability” or “no fault” system – your employer is responsible for paying certain benefits regardless of fault. Even though negligence is not an issue, employers and their insurance companies will still try to deny claims by asserting that you really did not get hurt at work, or that you were engaged in “horseplay,” or that you had a pre-existing condition. Unfortunately, even if your employer’s defense is ridiculous and outrageous, you still cannot sue your employer or the insurance company for bad behavior. Although workers’ compensation is designed to reduce the burden on injured employees by creating a straightforward system for medical treatment and missed wages, in reality, workers’ compensation cases are often hotly contested and employers and insurance companies will use provisions of the law against you. My job, as your lawyer, is to convince or force the insurance company to live up to its legal obligations. So, while you cannot sue your employer, you can insist that all benefits owed are paid.